23a. [1970s TV cartoon series, with “The”] (WHITE) PANTHER SHOW, crosses 19d. [B-Side of Bruce Springsteen’s “Dancing in the Dark”] (RED) CADILLAC. The WHITE and RED cross each other, and since White + Red = Pink… well, you get the idea. Side Note: Pink Cadillac is clearly superior to Dancing in the Dark. How is that the B-Side? 45a. [1973 #1 hit for Jim Croce] BAD BAD LEROY (RED), crosses 15d. [“Idaho cakes,” in diner lingo] HASH (GREEN)S. Red + Green = Brown. Actually, if you keep combining colors, eventually they all make brown. Learned that in kindergarten. 93a. [Title creature in a 1958 #1 Sheb Wooley hit] (RED) PEOPLE EATER, crosses 74d. [Military decorations featuring George Washington’s profile] (BLUE) HEARTS. Blue + Red = Purple. 119a. [Dystopian film of 1971] A CLOCKWORK (YELLOW), crosses 66d. [Easy-to-peel fruit] MANDARIN (RED). Yellow + Red = Orange. Any other theme answer suggestions? I imagine that the constructors decided to use RED as an element in all of the mixes for consistency in the theme answers, but I almost felt like I was cheating… especially with the squares being circled. After I figured out what was going on- which really only took filling in one long answer- the difficulty level changed from Typical Sunday to Tuesday-ish (perhaps easier?). These types of puzzles, where the solver can suss out the theme and immediately fill in the longest answers, often run the risk of falling flat, but this was clever and amusing enough to still be an enjoyable solve. The fill being above average for a Sunday helped as well. 105d. [Difficult conditions for sailing] CALMS. I know nothing about sailing. On a vacation in Mexico, I had to be rescued after I confidently rented a raft with a sail and assured my friend I knew what I was doing. So embarrassing. 49d. [Delighting?] OUTAGE. Took me a while to see the clue as a noun. 68a. [Target protector, perhaps], MALL COP. I think I’ll love the answer MALL COP any day, regardless of the clue. But that clue rules. There’s a really fun, but somewhat obscure Ben Folds song about a mall cop. Check it out. 5a. [Get ready for a long drive] TANK UP. Wanted GAS UP or even TEE UP, neither of which fits obviously, but cringed filling this one in. No one says that where I’m from. Is this a regional thing? 128a. [GPS, e.g., in military lingo] SAT NAV. New to me. Pretty ugly looking answer though. 8d. [Cabbage variety] KOHLRABI. Needed every cross for this, and assumed I had something wrong when it was filled in. Glad to put it in my temporary vocab though! A fun solve, though I wish it had more teeth to match the clever theme. 3.8 stars from me. Anybody else think that circling the colors in grid was perhaps unnecessary? The theme revealer at the end is 123a. 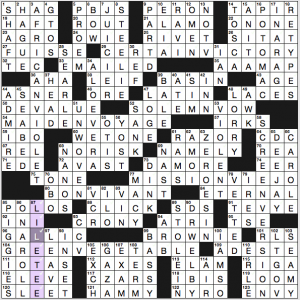 [Word homophonically hidden in the eight longest puzzle answers], ENVY. Each of those eight themers is a two-word phrase where the first word ends with N and the second word starts with V, and N-V sounds like ENVY. We’ve got CERTAIN VICTORY, SOLEMN VOW (though that N is silent! ), MAIDEN VOYAGE, MISSION VIEJO, BON VIVANT (though the clue, 80a. [Gourmet], does not fully encapsulate what a BON VIVANT is—they may be enjoying parties and fashion and travel more than fine dining), GREEN VEGETABLE, AFRICAN VIOLET, and SCREEN VERSION (not a term I’m so familiar with). 51d. [Not yet interlaced, as yarn], UNWOVEN. I thought threads were woven, while yarns are knit or crocheted? 60a. [Sloppy kiss], WET ONE. This answer is just to the right of SEABED with a [Wet floor] clue. Clean-up in aisle two! 59a. [Native of Nigeria], IBO. Most of the Naija folks I follow on social media use Igbo rather than Ibo. 99d. [Low in pitch], BASSY. I believe I’ve never seen this form of the word in my life. 68a. [Investment descriptor that should sound alarms], NO-RISK. Ha! I like this clue. 90d. [Med. man of ’70s TV], DR. WELBY. *scowl* No, he’s Marcus Welby. Marcus Welby, M.D. I never think of him as “Dr. Welby.” I mean, I wouldn’t expect to see MR. JOHNSON in a grid clued as Anthony Anderson’s Black•ish character, or MS. LEMON clued as Tina Fey’s 30 Rock character. Just looks weird. Worst crossing: 87d. [1992 Kentucky Derby winner], LIL E. TEE meets 96a. [Like some ancient Celts], GALLIC. Really?? When Celtic so strongly connotes GAELIC, why not go with a more obvious French connection for your GALLIC clue, particularly when that crossing is a weirdly named racehorse from 25 years ago? (I straight-up typed every letter in the alphabet from A to K in that spot before getting to L.) Yes, the Celts who crossed the English Channel to the French region and spread in Europe over 2,000 years ago included the Gallic people, but that seems far less well-known to me than the more modern French angle. 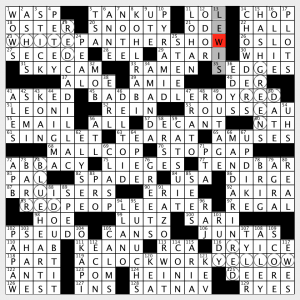 Seemed like there was more than the usual amount of old crosswordese and otherwise clunky fill in this grid. ON ONE, TEC, -EDE, D’AMORE, E’ER, SDS, -INI, ATRI, TSE as half of tsetse, RLS, ELAM, ELEVE … and those are just in the Acrosses. We have another installment in the Captain Obvious series! Today’s puzzle involves punny literal takes on theater terms. Nice whimsical theme. CHEWING THE SCENERY, a phrase meaning overacting (or EMOTE-ing, as seen in crosswords all the time), is new to me. Maybe I should have taken an acting class at some point. The clues for STEALING THE SHOW and ROLLING IN THE AISLES made me giggle. Not a TREKKIE at all. 53d. [Data analyst?] 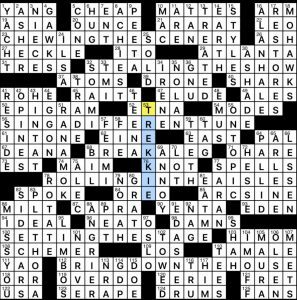 This clue is short and simple and brilliant. My mind immediately with to Star Trek here. I kept trying to make TROI or LAFORGE fit, and I legit did a happy dance when I filled in TREKKIE. Huge huge fan of Star Trek here. There is a debate about whether the term “Trekker” is preferable to “Trekkie.” Long story short, Trekkie is more of a pejorative term for fans of Trekdom who go way too far, where Trekker refers more to those fans who know the show was only a show. 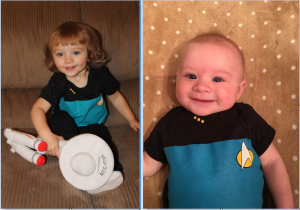 I, of course, would never sign into my medical school building with my then-fiancee as Deanna Troi and William Riker, or wear a T-shirt saying “I’m with Illogical” or “What Happens on the Holodeck Stays on the Holodeck”, or dress up my kids as science officers, or anything like that. Never. The clue [Fire sign] for stacking entries 22a. LEO and 26a. ASH. Nice. [Wrapped item at a fiesta] for both the food 110a. TAMALE and the article of clothing 123a. SERAPE. Double nice. 19a. [Polo grounds?] ASIA, where Marco Polo reportedly traveled. 52a. [Italian volcano seen in Vietnam?] ETNA, found in the word VIETNAM. That’s it for today. Until next week! An echolalic demonym theme. I’m quite certain I’ve never had occasion to put those two words together before now. 22a. [Ljubljana native’s spot for a tryst?] SLOVENE LOVE NEST. Here, I thought the gimmick was going to be anagrams, but that T was a mystery. 35a. [Muscat native’s salon visits?] OMANI MANI-PEDIS. 39a. [Element No. 68 from Belgrade?] SERB ERBIUM. 58a. [Doha native’s Asteroids?] QATARI ATARI GAME. 78a. [Bangkok native’s beehive?] THAI HAIRDO. 80a. [Minor prophet from Prague?] CZECH ZECHARIAH. 98a. [Lusaka native’s surroundings?] ZAMBIA AMBIANCE. Each demonym is signalled by invoking a native of that nation’s capital city. Each repeated segment omits the first letter of the demonym. Consistency. What isn’t consistent—but which is also unreasonable to expect—is the number of letters after the repeated part, and pronunciation (this is most notable in THAI/HAIRDO). Not part of the theme: 23d [Niamey’s country] NIGER. Going to keep it short here. 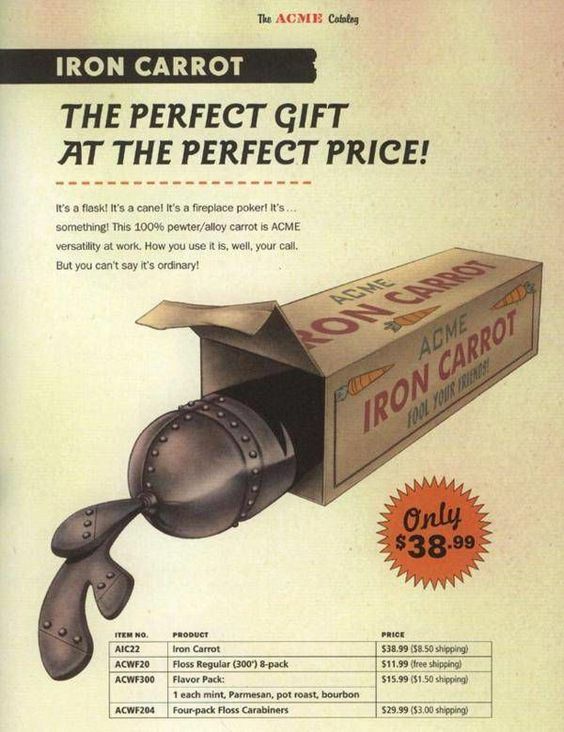 3d [ACME product that’s an inedible heavy vegetable] IRON CARROT. From the 1961 cartoon Compressed Hare. Minor agreement error: 54a [Farm crawlers] ANT. 87a BLAST crossing 82d [Big exploders] H-BOMBS. Unfortunately, the former is clued as [Great time]. 85a [“__ dirty job …”] IT’S A, 92d [Difficult job] SLOG, which I consider to be more of a tedious or, yes, dirty one rather than difficult. 11d [Foot gunk] TOE JAM. Come together. 41d [Messi’s team, for short] BARCA. Barcelona, presumably? I think I might’ve >gasp!< something like [Commercial prefix with -lounger]. That’s how little I cared for the clue. Apologies for not highlighting more particularly clever or fun clues. This entry was posted in Daily Puzzles and tagged Brendan Emmett Quigley, Evan Birnholz, Garry Morse, Jeff Chen, Tracy Gray. Bookmark the permalink. Enjoyed the NYT, but it took longer than expected. ASHES to ASHES eluded me until the end. As for sailing adventures, I was asked to go out off the New Jersey shore as passenger, had to get us back safely when a storm arose! NYT: I, too, thought the circles were unnecessary, although if they hadn’t been there I might be on my second cuppa right now, still solving. There were lots of clues and answers to enjoy, and I’m always glad to have a Bruce Springsteen or Jim Croce song running through my head. I enjoyed your review, Jim, and the color graphic, but I want to entreat you to move KOHLRABI from temporary to permanent vocabulary storage and then go out and buy some. It’s delicious raw (hummus makes a nice complement) or cooked. Nice puzzle, Ms. Gray and Mr. Chen! I’ve been making my own sauerkraut recently… salt, cabbage and letting it ferment in mason jars. After coming across this clue I wondered how it would work with Kohlrabi. Googling around and sure enough lots of recipes to ferment with it as well. I’ll bet it will make wonderful kim chi. Now I’m all hungry. I’ve done the 1000 piece version– the 5000 piece version would be great if I didn’t actually have to work for a living. I just looked at those puzzles. Wow. Amazing. Very impressive feat! Definitely agree about the circles in the NYT. An unnecessary gift. 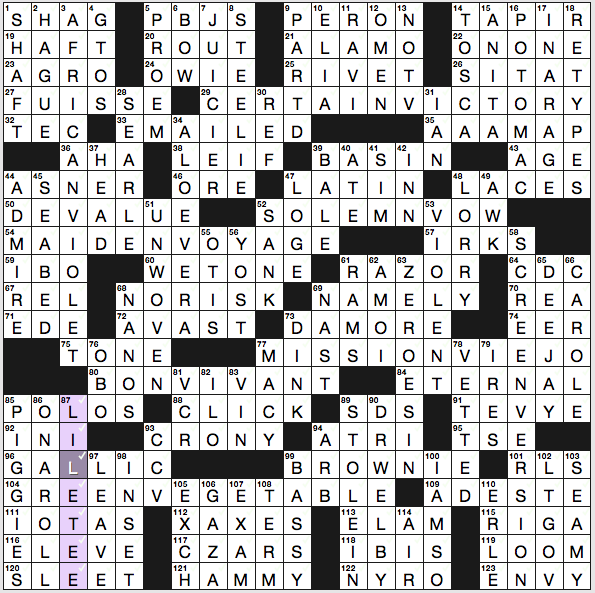 Oh, drat, I got the NYT and WaPo puzzles confused. NYT is the colors puzzle. Aarrgh. NYT: I would have been pretty lost without the circles. It’s asking a lot for the solver to piece together that two incorrect but crossing answers represent the right answer based only on the name of the puzzle. As for Springsteen: it’s a different world now but if one were to listen to Top 40 radio circa 1983, it would make sense that a record label chose Dancing in the Dark as the A side. I agree with Christopher. If one doesn’t see the gimmick, it’s nonsense. For good solvers who have most of the crosses filled in, the gimmick is discernible. But, if not, it’s hard to see a red in one direction but an unrelated set of letters going the other way. Don’t forget, there is a range of solving abilities and many spot it quickly and others of us have to plow through it step by step. NYT: The circles did make it pretty simple, since it was obvious where RED went as soon as you got one of the crosses, and the other colors were pretty to guess as well. I wonder if it would have been easier or harder if the circles had been appropriately colored squares (e.g., pink, brown, etc. ), although that’s probably not doable in any format save print. Seemed pretty thin as themers were concerned. A nice taste but I was left wanting more to eat. WaPo: Very funny. I’m not always a big fan of Captain Obvious, but this iteration was amusing. 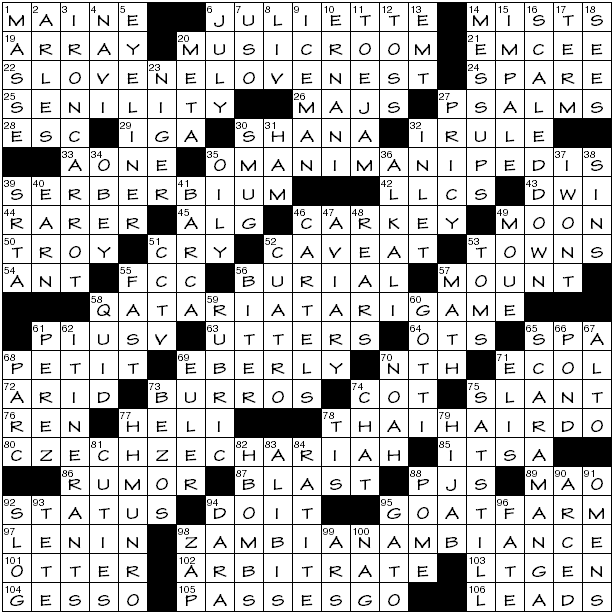 Enjoyed the WaPo puzzle a lot. As for the NYT, the idea is clever, but I’m one of those people who would have been totally lost without the circles. And even with them, it took me forever to catch on. I kept trying to create meaningful rebus solutions, which of course didn’t work. Oh well…. I agree that the circles were unnecessary, but for the entire puzzle I didn’t get that the colors’ crossings made the substituted colors, e.g. red + white = pink. I just went along thinking the colors were being randomly subbed out. Duh on me. One thing I liked about the LAT is MAIDEN VOYAGE (Titanic undertaking) crossing SANK (not clued Titanicly, but still). But like Amy, I feel that a BON VIVANT is much more than a gourmet. Much more active, and might possibly be eating less-than-gourmet food, but enthusiastically and while dancing. Really enjoying life. Also, I could do without Kentucky Derby winners entirely. They are not as easy to suss out as are Spice Girls and airport codes. Amy. I love having you do the Sunday LAT. Thanks a lot! NYT was very fun. Terrific theme and execution. Well done!